If you have ever made a key lime pie, the chances are that you might have a little sweetened condensed milk left in the can. Besides grabbing a spoon and tickling your sweet tooth, there are a few ways you can use the leftovers in that can. Condensed milk is popularly used all over the world. It is commonly found in pies and baked goods, like a flan or tres leches cake from Spanish-speaking countries. Condensed milk is also used in beverages in East Asia, and as a sweet snack in Slavic cultures. A very common use for sweetened condensed milk is making a caramel, technically dulce de leche, as it is called in Spanish-speaking countries. You can pour the remnants of a can of condensed milk into a saucepan and simply heat it on the stove to brown it and thicken it, which gives it more of a caramel color and flavor. During the communist era in Poland, kajmak, a boiled can of condensed milk, was used as a cake icing or put between dry wafers. It was also used in Russia in almost the same way. Similarly, you can follow these examples and use boiled condensed milk to dress cakes or spread on wafers. As is the custom in Asia, you can feel comfortable substituting condensed milk for sugar and cream. In Malaysia, tea that is mixed with condensed milk is very common. It is called teh tarik. For breakfast, you can forgo jelly or jam and instead spread some condensed milk on your toast or bagel in the morning. In England following World War II, with a shortage of sugar, condensed milk was a popular topping that used to take the place of jams. Condensed milk is made from cow's milk, from which water has been removed. It is most often sold canned in the form of sweetened condensed milk with sugar added. The two terms "condensed milk" and "sweetened condensed milk" are often used synonymously today. Sweetened condensed milk is a very thick, sweet product. When canned, it can last for years without refrigeration if not opened. Condensed milk can be made from evaporated milk by mixing one measure of evaporated milk with one and a quarter measures of sugar in a saucepan, then heating and stirring the mixture until the sugar is completely dissolved, then cooling. You can also make condensed milk by simmering regular whole milk and sugar until it is reduced by 60 percent. Condensed milk has been on the market since 1856. Gail Borden invented the process to make condensed milk after he returned to the United States from a trip to London. On that trip, he had seen babies dying aboard ship because they did not have a source of pure, fresh milk. For three years, he worked on the process, inspired by Shakers in New York who used vacuum preservation methods to preserve fruit. He developed a similar process for evaporating the water from milk and then added sugar as a preservative. He also found a way to seal it into small cans. Borden developed the largest and most advanced milk factory of his day. More than 200 dairy farmers supplied 20,000 gallons of milk daily to the factory as demand increased driven by the American Civil War. Calorie and nutrient-dense, a can of condensed milk were included in a Union soldier's war rations. Borden's company was the New York Condensed Milk Company, later called the Borden Company. 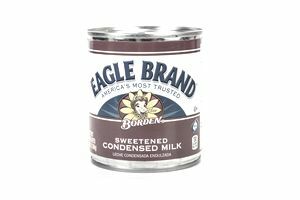 Today, it's known as the Eagle Brand, which is still the most popular brand of condensed milk in the United States.